Raised Garden Beds: 3 Great Woods to Use - Goosebay Sawmill and Lumber, Inc. So you’ve done some research and decided that raised garden beds are for you. Now you need to decide what lumber to use, and get some tips on just how to construct your beds. Here is a guide for which wood to choose, some design ideas, and a few tips that will make your beds keep their form and last longer. The wood you are looking for will be naturally rot and bug resistant. What does this mean? The resins in certain species help the trees defend themselves against the effects of nature, namely decay and pests. The lumber sawn from these species will retain these desirable (for our purposes) qualities. You don’t need to have planed lumber – buying it in the rough will be more cost effective, and the dimensions will be “true” (i.e. your 2×6 will actually measure 2 inches by 6 inches.) Just make sure you wear gloves if you want to avoid any possible splinters. “Green” or unseasoned lumber is fine for raised beds. Kiln-dried lumber has had most of the moisture extracted from it in order to keep it from shrinking and cracking in interior applications. Your lumber will be exposed to water, which has a 100% moisture content, and the summer air (think of the relative humidity number in the weather forecast.) Kiln drying is one less process to pay for. Here in New Hampshire, one of our most prolific indigenous species is Eastern Hemlock. We have found that, at a fraction of the cost of cedar or fir, it will last in the ground up to seven years. It is definitely the local favorite wood choice for raised bed gardening. Douglas Fir, or Doug Fir, is another great wood to use. It is readily available locally, and although it is largely grown in the western states, the trees are often planted in New Hampshire. We do saw some Doug Fir in our mill. There are several grades of Doug Fir available. The most cost-effective is essentially a “mill run” grade that allows for sound tight knots. This means that the knots will not fall out and create holes in your piece of lumber. Even this grade will cost approximately three times the cost of the Eastern Hemlock. If you still like the idea of the Red Cedar, but not the price tag on the higher grade, take a look at the “mill run” or knotty grade. 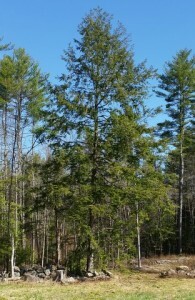 It’s still pricey, at about four times the cost of the Eastern Hemlock, but is fraction of the cost of the clear grade. And, if your garden area is on a slope, here’s an article that will help you adjust your design to compensate and keep the top of your raised bed level. I do have a couple of comments on the fasteners recommended in the video. It calls for galvanized decking screws. These are nice long screws that are relatively easy to install, but the heads of these screws are very small. The wood along the side of your raised bed is subject to intense outward pressure from the soil against it. Over time the tendency will be for the wood to push itself over the head of the screw and potentially come apart. A great step up from the decking screws would be to consider 3 1/2 inch long galvanized structural screws instead. These screws are easy to install and have a much larger head than the decking screws. This will help hold your sides in place despite the outward pressure of the soil. If you aren’t familiar with this type of screw, here is an informational article. 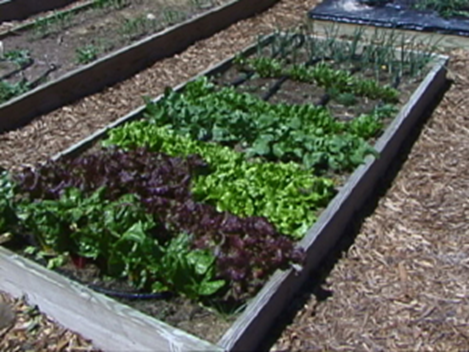 A common width for raised beds is 4 feet. This makes the entire bed within your reach. But you need to be mindful of the length of your raised beds. The longer the bed, the greater the outward pressure from the soil. The maximum length of each bed should be 6 to 8 feet. If you want it longer then you should add interior partitions. In order to create a partition what you would do is to essentially create another endwall. For example, using the design from the above video, each partition would consist of an additional 4×4 support on each sidewall and a wall made of 2×6’s between the two 4×4’s.